For centuries Umbria has been a land of artists and artisans who have achieved high mastery of their art. 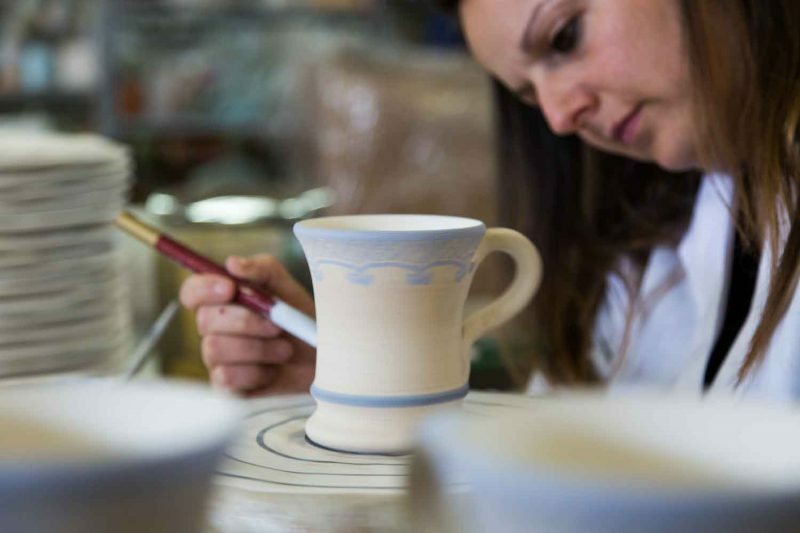 Masters of ceramics, weavers, goldsmiths, glassmakers, printers and woodcrafters are distributed across the region. Make time to visit the artist studios or manufacturing plants at the same time you tour the beautiful countryside. We previously discussed the Umbrian ceramic tradition in a previous post. The most notable towns in the Umbrian Ceramic corridor are between Deruta, Orvieto, and Città di Castello. The Umbrian region’s towns are known for fine handicrafts, which developed, based on the local supply of indigenous raw material and historic processing techniques. From cashmere to lace, from tulle to hemp, real niche work. Fabric production’s origins date to the Middle Ages, when around the twelfth century; it reached such a high level that local shops began to market their products throughout Europe. Today, cashmere, one of the most well known, desirable fabrics has many foreign tourists traveling around Lake Trasimeno known as Cashmere Valley. Here, beside numerous artisan studios, major fashion houses are operating such as Brunello Cucinelli, whose popular boutiques are found in all major cities. Cucinelli is determined to preserve the historic and mostly handmade working techniques that have given them great success. Umbrian goldsmiths are artisans of the highest level and true art historians as they recreate ancient techniques like granulation that dates back to the Etruscans. Orvieto’s Faina Museum is the best place to see this type of art, as well as the museums and goldsmith studios in Perugia, Torgiano, Spoleto and Terni. The Umbrian town of Piegaro has the oldest tradition of glass manufacturing. It is no wonder that the 14th century glass masters of Piegaro created the Duomo of Orvieto’s magnificent stained-glass windows. Just a few steps from the Rocca Paolina in Perugia’s historic center is the world-famous Moretti-Caselli studio. Artistic stained glass windows and typical portraits from 1859 are still produced there today. In Umbria the town Città di Castello is the center of lithography and printing since the Grifani-Donati Typography studio has been located there since 1799. A true cultural institution it is situated in an old convent in the historic center. Grifani-Donati is still active and maintains a deep commitment to preserving not only the historic printing techniques, but also the obsolete machinery that have become the cultural heritage of the city. Wandering through the rooms of the Grifani-Donati Museum you can view thematic exhibitions, cultural initiatives and demonstrations of the ancient print processes. In addition to ceramic and lithography, Città di Castello is also known for furniture manufacturing. Local artisans specialize in the production of classic furniture made of solid or seasoned wood which is appreciated throughout Europe for its quality, design and workmanship. At the Palazzo Vitelli’s Pinacoteca at Cannoniera you can admire the collection of furnishings that Elia Volpi, art dealer and antique dealer, donated to the city in 1912. The art of wood inlay was spread throughout surrounding regions in the 400’s by Umbrian artisans and artists. The most well-known of which was Antonio Bencivenni who made important works for the College of Change, based on Perugino’s drawings, and the Choir of the Cathedral of Todi.